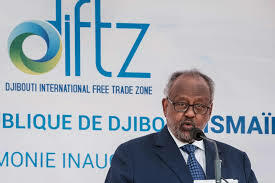 Djibouti launched the first phase of Africa’s biggest free trade zone, seeking to capitalize on its strategic position on one of the world’s busiest trade routes. It also unveiled three new ports and a railway linking it to landlocked Ethiopia as part of its bids to become a global trade and logistics hub. Djibouti the first phase of Africa’s biggest free-trade zone, seeking to capitalize on its strategic position on one of the world’s busiest trade routes. The Horn of Africa nation, located at the mouth of the Red Sea and Suez Canal, unveiled three new ports and a railway linking it to landlocked Ethiopia, as part of its bid to become a global trade and logistics hub. “The pilot phase launched comprises a 240-hectare site. On its scheduled completion 10 years from now, the $3.5bn initiative will span 4 800 hectares – the largest free-trade zone on the continent. “The project hopes to see foreign companies setting up manufacturing plants within the zone, adding value to products instead of merely importing and exporting raw materials. “The volume of goods travelling to East Africa keeps increasing. Every time a product arrives in the continent without being transformed it is a missed opportunity for Africa,” said Aboubaker Omar Hadi, chairperson of the Ports and Free Zones Authority. A row of Djiboutian and Chinese flags fluttered side by side above the freshly painted bright yellow walls surrounding the expansive project – a symbol of the tiny country’s close ties to the Asian giant whose loans have funded its lightning-fast infrastructure growth. Djibouti – which is also the site of China’s only overseas military base – is a critical part of China’s “Belt and Road” global infrastructure initiative and in a prime position along what has been dubbed the “Maritime Silk Road”.